If a group chat room is entered, Monal will join it and it will show up in both the active chats list and as an online “user” in the contacts list. Talking in a group chat is the exact same as talking in a normal one. When entering a room, Monal requests the server send the last 5 messages of the conversation if it is available. If invited to a room, Monal will ask to accept the invitation and join the room if accepted. A room is joined by going to In the More-> Group chat. If the server supports it, Monal will discover at login what the address of the group chat service is. The server field on this page will be filled with the correct information if it is discovered. After entering the room name and a password if necessary, tap join to enter the chat. Monal will either connect or return an error. To leave a room, swipe the item in active chats and press the close button. Not available in the current build but will be available in the future. Monal is super useful for me, as we have some MUCs setup with monitor bots reporting to chatrooms, so that we keep tabs on systems, & with monal’s MUC capability, I can now do that with my phone. cool. I joined a XMPP chat room, and the people using PC’s or Macs can see me in the chat room, so I know it was successful. But the room is not showing up in “active chats”. Even if someone types a message into the chat room, i can’t see it on my phone. (using an iphone 4). Any hints/help? I have this same problem, so it still hasn’t been fixed whatever it is. I am in the process of overhauling the entire MUC system. It should resolve a lot of issues. I was not able to join a group chat room. I can connect to the Openfire server we have just fine and send messages to individuals, but when I try to put in the information to login to the group chat, nothing happens. It doesn’t connect, it doesn’t give any errors either. Any suggestions on the exact format for the entries on the login page or what could be causing this issue? A roster of users in current MUC would be very useful. Do you have à ETA on Next release? the software workshops just fine except the MUC system imo. I would like to see a possibillity to manually enter the number of chat messages stored on the server when connecting to the room? I would allso like to be able to enter when to logoff the room or server. As of now i loose alot of messages since im logged out to quickly. In the future i would very much like to see the time when all users in the chat room has read the message, somthing like in the iGotChat messenger software. Thankyou for the time you are investing in this project, its much appreciated by me and many of my friends. A release is long overdue. Hopefully very soon. next release should have a much more resilient connection and improved muc among other things. It would be really helpful if there was some autojoin group capability like the PC Spark client. Right now, you are required to manually retype and rejoin each group chat every time you log on. Actually, I’ll be posting screenshots of the new ui with muc fixes soon. since the last update the group chat does not work anymore. You can enter the room, server, pwd press join and nothing happens. I used Monal because of this feature. I’m having the same issue as Peter. I enter the room and server, press join, and nothing happens. No error message either. Anu, our company uses an OpenFire server on our intranet and would very much like to adopt the use of your program so that we can use the MUC support. However, this feature appears to currently be broken or “bugged” in the newest version. We would be willing to provide you with some financial support for an update that would fix this bug. Please contact me at the e-mail address I provided so we can discuss this. Well. It seems that Monal doesn’t auto joins previous group chats so you always have to enter the group chat info at each server connect. Just to clarify, which are you working on? I, like others, seem stuck with not being able to join a chat w/o an error. So… Any news on a new version of Monal? Last update has been a while back. Are you not able to connect at all or is it specifically Muc that doesn’t work? Using with NWSChat with an iPhone 5S. Have (3) showing on the Active Chats icon at the bottom. Had (2) showing before I joined a room. Touching the icon just brings up the list of Active Chats, of which I have reviewed all messages. What does this number come from, & what does it mean? Pleas add Nickname for chat rooms. for that kids has become the prime-concerned concern for your parents. specially watchful about their ocular health. I’m using this with our university account and really need use of the Muc. I’m experiencing the same error that has been described previously where I cannot enter the chat room and it does not give me an error message, it simply does nothing. I’m not sure if this app is still being supported. I hope so, it seemed to have such promise! Also if there was a way to save that group chat room, it would be fantastic. 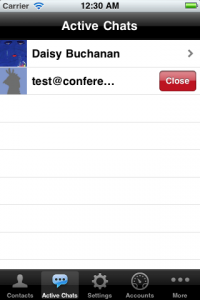 Your app is the best xmpp client on iOS! However, group chat just doesn’t seem to work for me. I go to the menu to join a group chat but whether request a list of rooms or I type in the room name nothing happens. No response and no error or notification or anything. Same problem as in previous message by Alex. 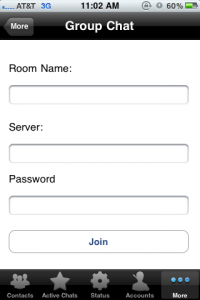 Room name and password 100% correct, after pressing Join button nothing happens. No error message also. Having the same problems with group chat, I press join or get room list and nothing happens. Really like the client otherwise. Like others on this list, I’m having problems with Joining Group Chat and getting the list of rooms. The openfire LAN server is doing great with various client OS’s, but struggling mightily to get Monal to join the group chat from iOS. The user to user messages work so I’m not convinced the problem is with the server configuration. And the rooms are joining from Pigin/Adium/Spark etc. When I push either of Join or Get List of Rooms, the UI acknowledges the ‘click’ but doesn’t appear to do anything?